Ethan Happ all over RU to start the game. Already drawn 2 fouls and grabbed a steal. #Badgers Gard -- the new Shot Doctor -- was working with Happ on FTs last week. He is 4-4 so far. Vito Brown with big time block. Already has three rebounds in three minutes. #Badgers and Rutgers tied at 6 at the first break. UW 0 of 3 from 3-point range, 1 of 4 overall. Ethan Happ with all six points for the #Badgers so far, including a 4-for-4 start at the free throw line. So #Badgers just 1-4 shooting and Rutgers, worst in the B1G in league play, is 3-6. Tied at 6-6 with 15:59 left. #Badgers 0-3 from deep. Have taken just 1 two-point shot. Happ has all six points. Iverson and Hill for Showalter and Brown out of the break. Ethan Happ runs the floor. Ethan Happ lays it in. Ethan Happ has all eight points so far for the #Badgers today. Happ with the steal. He has all eight points so far for the Badgers. Hill & Iverson in for the Badgers. Jordan's 3 gives the #Badgers the lead again at 11-10 with 13:49 to play in the first half. Wisconsin takes an 11-10 lead off a 3-pointer from Jordan Hill - the first points made by a UW player not named Ethan Happ. Pikiell just lost his mind on the shot clock violation. Ethan Happ putting on an absolute SHOW at @TheGarden right now! Happ a perfect 3-for-3 from the field after a beautiful spin move in the low block. 10 points for the sophomore. 13-10 UW at 11:56. #Badgers up 13-12. Happ has 10 points and assisted on UW's only other basket, a 3-pointer by Jordan Hill. Ethan Happ with 10 of the #Badgers ' 13 points so far. Ethan is 3-for-3 from the floor and 4-for-4 at the FT line. Happ is 3-for-3. His teammates are 1-for-8. Timeout on the court. RU doesn't have an answer for Happ right now but are doing well to keep it close. #Badgers Happ 3-3 FGS, 4-4 FTS for 10 points. Rest of team is 1-8. UW has a 13-12 lead with 11:36 left. Rutgers has 12 points -- 10 in the paint. Thus, the Scarlet Knights are shooting 50-% (6-12) #Badgers ' D not stout. Badgers 1-6 on 3PT FG to start the game. #Badgers now 1-7 from 3. Woof. 11 points, 3 steals, 1 rebound and 1 assist for Ethan Happ so far today. 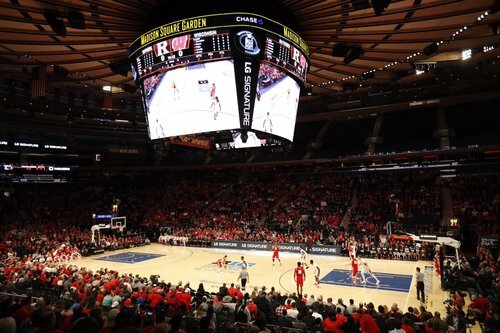 Rutgers leads 17-16 with 7:50 left. The Scarlet Knights have committed eight turnovers. RU wants to grind you with defense and keep it low scoring. 12 mins in, it's 17-16. Badgers shooting 29%, 14% from three. #Badgers trailing by 1 and are shooting 1-7 from 3 and 5-17 overall. Brrrr. Happ 3-5/rest of mates 2-12. We've got a good one so far at @TheGarden . Happ has a game-high 11pts. #Badgers shooting just 29% FG, 14% 3FG. Wisconsin shooting 29.4 percent in the first half. Badgers have shot under 42 percent in the 1st half of 5 B1G games, including last 3. On the plus side, RU shooting 50%, UW shooting 29% and RU is only up one. If Badgers can start dropping shots, this one may turn fast. #Badgers Koenig (0-3), Hayes (0-2) and Brown (0-2) a combined 0-7. Earlier foul on Rutgers changed from Freeman to Gettys, who now has two. Badgers offense is giving me flashbacks of 1st Round NCAA game vs. Pitt. Penetration & FTs keeping game close. Ethan Happ spinning on 'em ??? ?